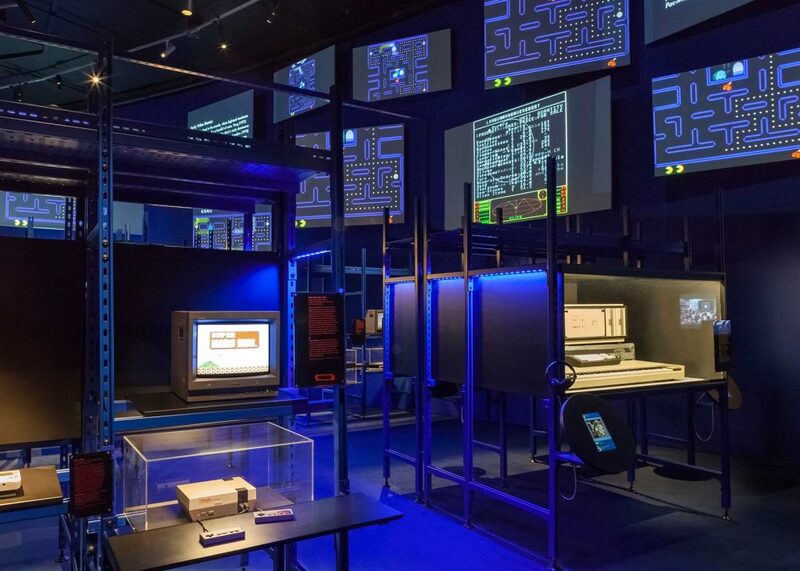 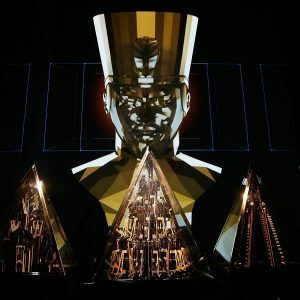 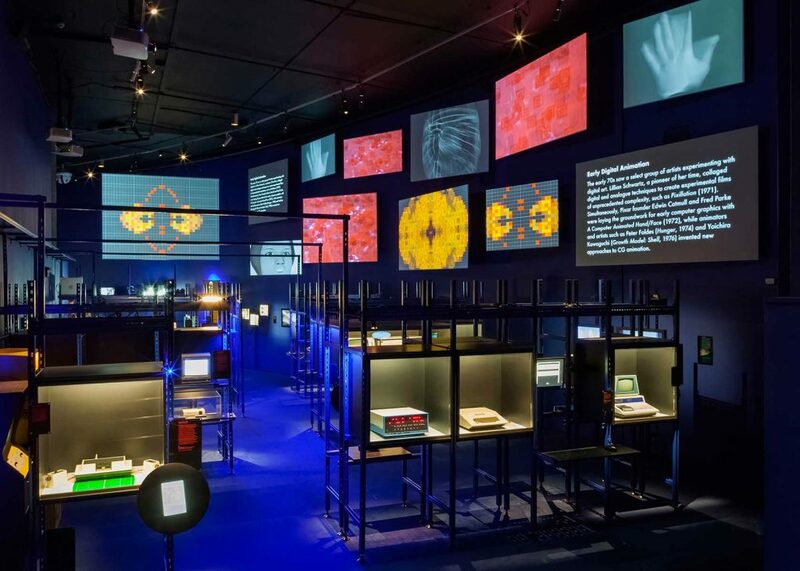 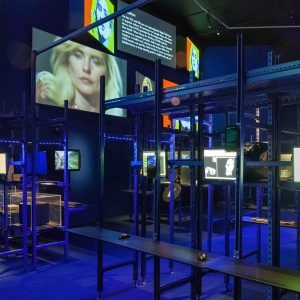 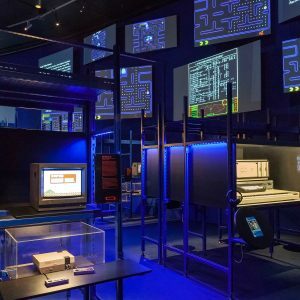 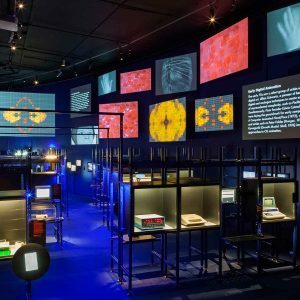 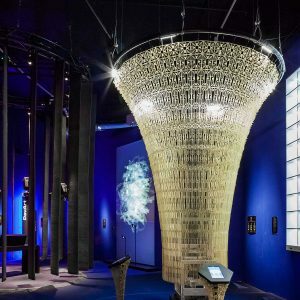 Brief: To design a major touring exhibition celebrating digital creativity across art, film, music, fashion and gaming. 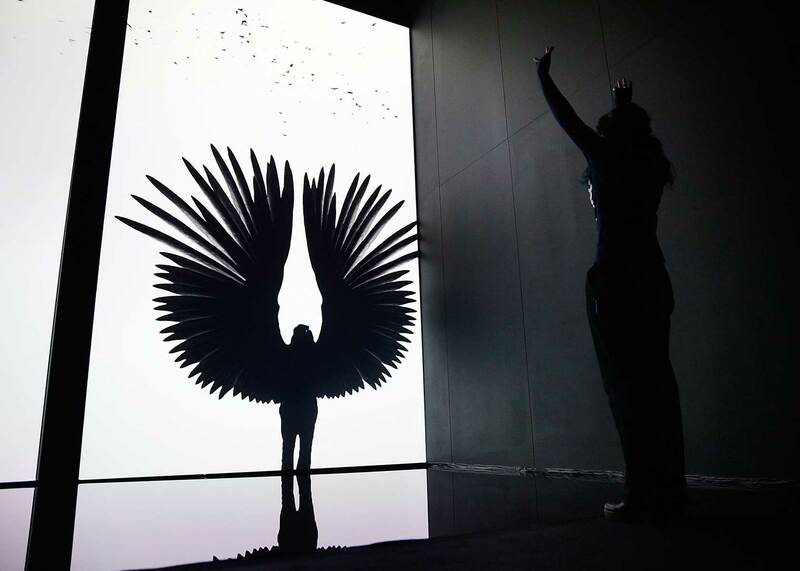 The most comprehensive presentation of digital creativity ever to be staged in the UK, and delivering record visitor figures for the Barbican’s Curve Gallery, Digital Revolution brought together a range of artists, filmmakers, architects, designers, musicians and game developers, all pushing the boundaries of their fields using digital media. 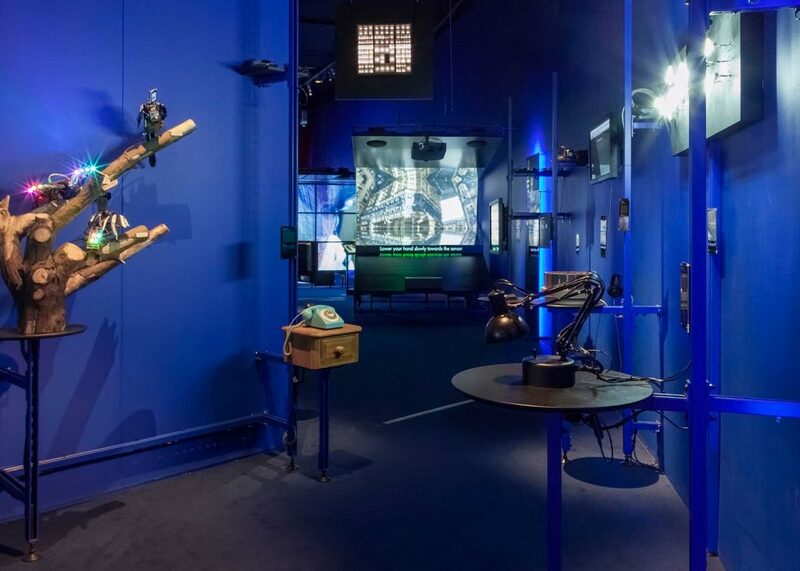 To support the diverse range of commissions involved we rendered the gallery walls, floor and exhibition furniture in a deep ultramarine blue. 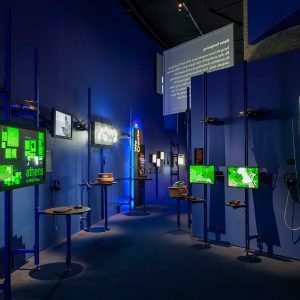 This dynamic colour served to glue the collection of disparate works together, dematerializing the physical architecture of the space and immersing the visitor in the interplay of digital glow and shadows. 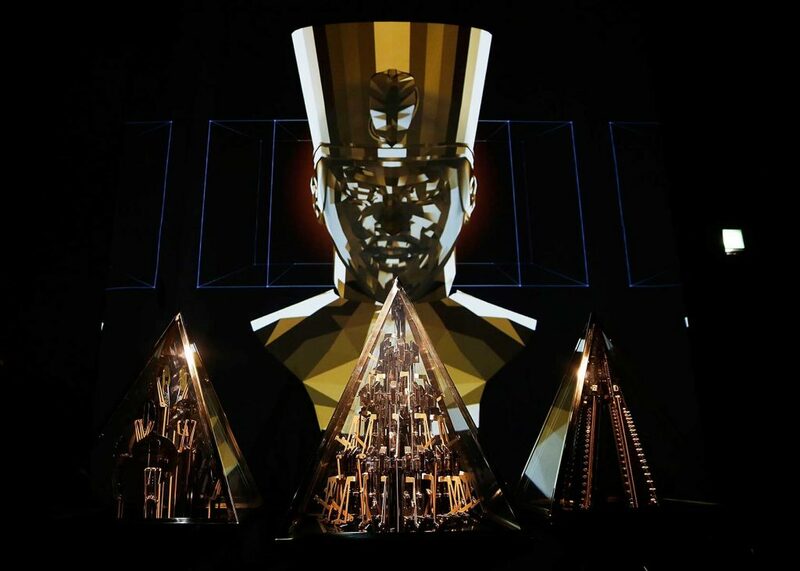 ARD collaborated with media designers 59 Productions to create a seamless journey through diverse content. 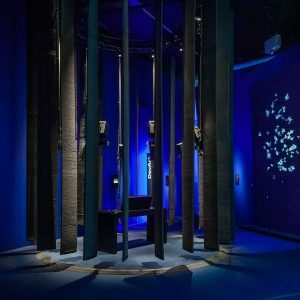 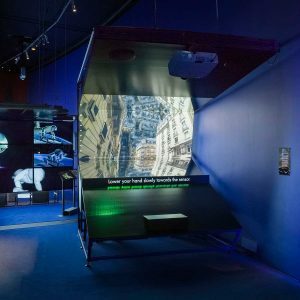 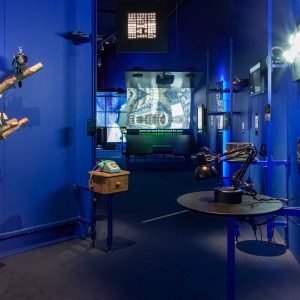 From the very moment of arrival, choreographed audio and projection sequences drew visitors through the Curve gallery exhibition and beyond via a series of interactive installations across the public foyers of the museum. 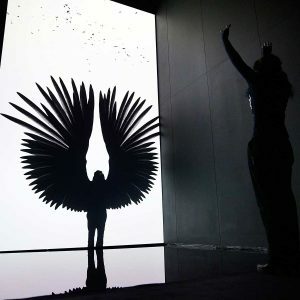 Over 30 artists created new works or arrangements for the show (including ‘Gravity’ by Framestore, ‘Inception’ by Double Negative, ‘Music Box’ by Wil.i.am, Yuri Suzuki and Pasha Shapiro and ‘Treachery of the Sanctuary by Chris Milk) the exhibition structure had to be very flexible, to allow for installations to be tested and finalised on site. 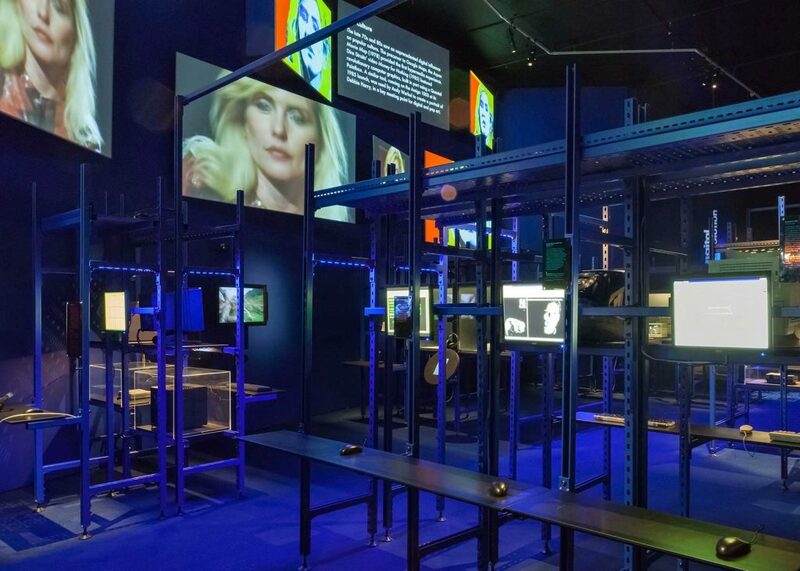 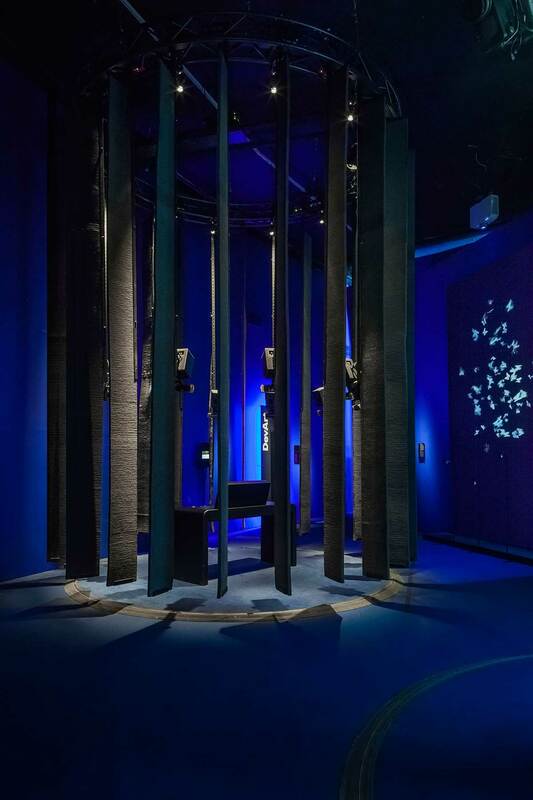 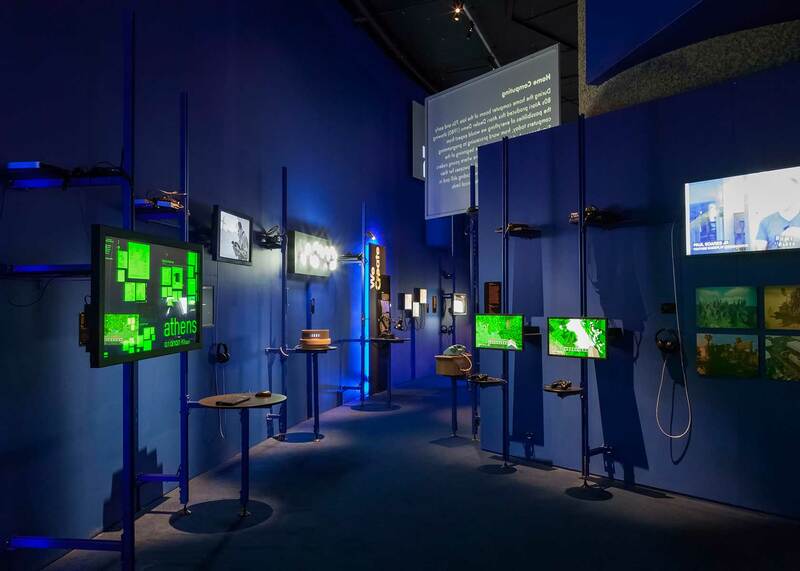 The display language was established in Unistrut – a classic M&E framework transformed through a blue powder-coat finish – which celebrated the great volumes of A/V equipment required, its blinking lights and cabling on open display. 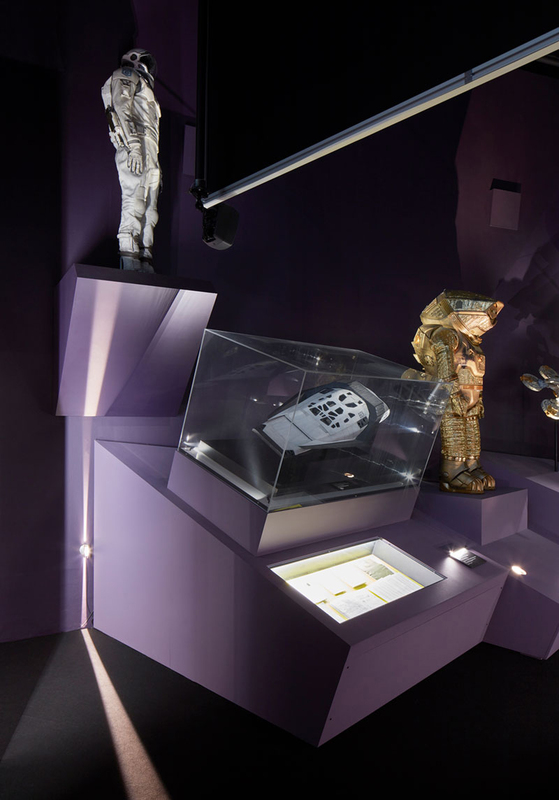 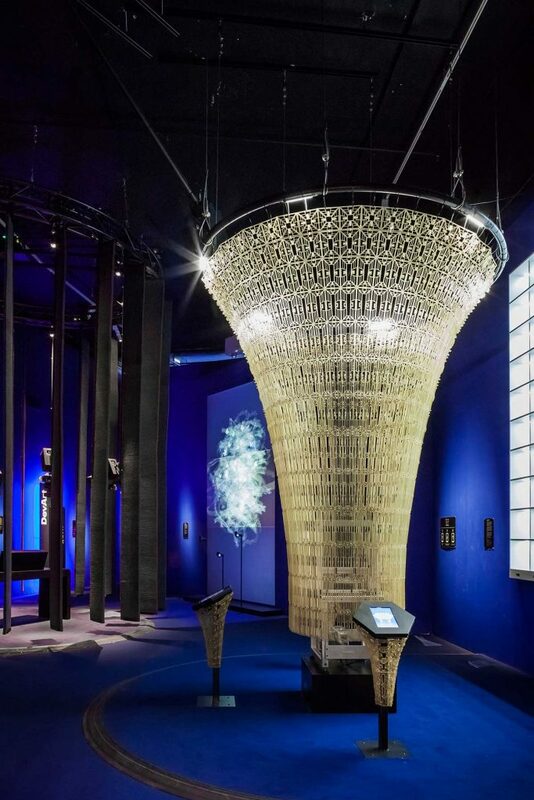 The use of this material allowed the display mechanism to function as an autonomous structure that did not rely on the existing architecture for support. 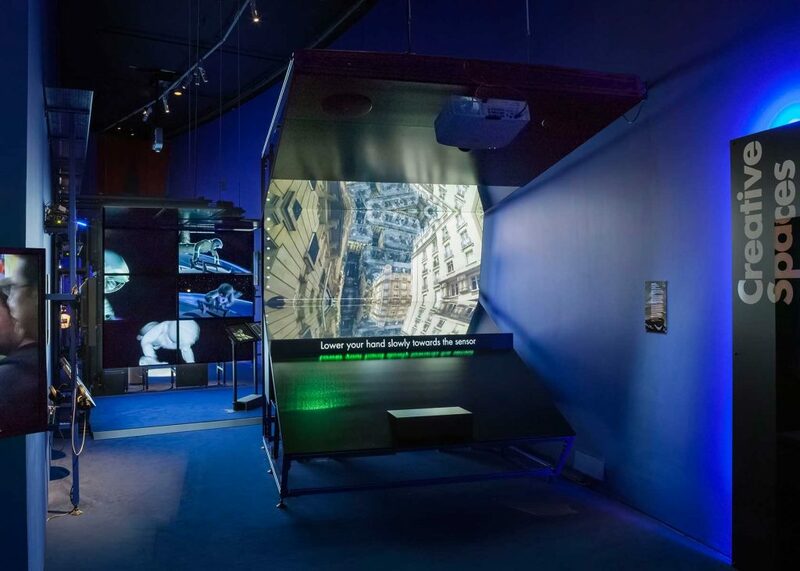 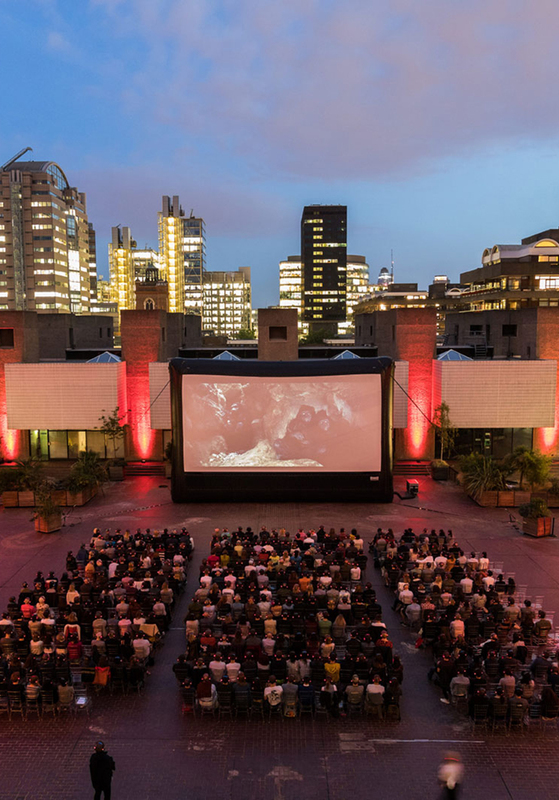 This enables it to tour internationally, adapting to any kind of museum or event space.